Prior to 1879, direct current (DC) electricity had been used in arc lights for outdoor lighting. In the late 1800s, Nikola Tesla pioneered the generation, transmission, and use of alternating current (AC) electricity, which reduced the cost of transmitting electricity over long distances. Tesla's inventions used electricity to bring indoor lighting to our homes and to power industrial machines. Amber is a very pretty goldish brown "stone" that sparkles orange and yellow in sunlight. Amber is actually fossilized tree sap! It's the stuff used in the movie "Jurassic Park." Millions of years ago insects got stuck in the tree sap. Small insects which had bitten the dinosaurs, had blood with DNA from the dinosaurs in the insect's bodies, which were now fossilized in the amber. Ancient Greeks discovered that amber behaved oddly - like attracting feathers - when rubbed by fur or other objects. They didn't know what it was that caused this phenomenon. But the Greeks had discovered one of the first examples of static electricity . The Latin word, electricus, means to "produce from amber by friction." So, we get our English word electricity from Greek and Latin words that were about amber. Electricity is an apparent force in nature that exists whenever there is a net electrical charge between any two objects. Electricity is a form of energy produced by the movement of electrons. All matter is made up of atoms, and atoms are made up of smaller particles. The three main particles making up an atom are the proton, the neutron and the electron. Electrons spin around the center, or nucleus, of atoms, in the same way the moon spins around the earth. The nucleus is made up of neutrons and protons. Electrons contain a negative charge, protons a positive charge. Neutrons are neutral -- they have neither a positive nor a negative charge. Electrons can be made to move from one atom to another. When those electrons move between the atoms, a current of electricity is created. The electrons move from one atom to another in a "flow." One electron is attached and another electron is lost. Since all atoms want to be balanced, the atom that has been "unbalanced" will look for a free electron to fill the place of the missing one. We say that this unbalanced atom has a "positive charge" (+) because it has too many protons. Since it got kicked off, the free electron moves around waiting for an unbalanced atom to give it a home. The free electron charge is negative, and has no proton to balance it out, so we say that it has a "negative charge" (-). Scientists and engineers have found several ways to create large numbers of positive atoms and free negative electrons. Since positive atoms want negative electrons so they can be balanced, they have a strong attraction for the electrons. The electrons also want to be part of a balanced atom, so they have a strong attraction to the positive atoms. So, the positive attracts the negative to balance out. The more positive atoms or negative electrons you have, the stronger the attraction for the other. Since we have both positive and negative charged groups attracted to each other, we call the total attraction "charge." When electrons move among the atoms of matter, a current of electricity is created. This is what happens in a piece of wire. The electrons are passed from atom to atom, creating an electrical current from one end to other. Electricity is conducted through some things better than others do. Its resistance measures how well something conducts electricity. Some things hold their electrons very tightly. Electrons do not move through them very well. These things are called insulators. Rubber, plastic, cloth, glass and dry air are good insulators and have very high resistance. Other materials have some loosely held electrons, which move through them very easily. These are called conductors. Most metals -- like copper, aluminum or steel -- are good conductors. Static electricity stays in one place and doesn't move like current electricity. Lightning is the most spectacular example of static electricity. This is a huge spark that flows between positive charges in the top of a thunder cloud and negative charges in the bottom. Current electricity is the flow of electric charge through a substance that conducts electricity. Volts, amps, and watts measure electricity. Volts measure the "pressure" under which electricity flows. Amps measure the amount of electric current. Watts measure the amount of work done by a certain amount of current at a certain pressure or voltage, it was named to honor James Watt, the inventor of the steam engine. Ampere - a measure of current -One amp is defined as 6.28 x 10 18 electrons per second. Volt - A volt is a measurement of electromotive force in electricity. This is the electric force that "pushes" electrons around a circuit. "Volt" is named after Alessandro Volta, an Italian physicist who invented the first battery. Watts describe the rate at which electricity is being used at a specific moment. For example, 100 watts describes the amount of electricity that a 100-watt light bulb draws at any particular moment. Watt-hours measure the total amount of electricity used over time. Watt-hours are a combination of the how fast the electricity is used (watts) and the length of time it is used (hours). For example, a 100-watt light bulb, which draws 100 watts at any one moment, uses 100 watt-hours of electricity in the course of one hour. Kilowatts and kilowatt-hours are useful for measuring amounts of electricity used by large appliances, such as refrigerators, and by households. Kilowatt-hours are what show up on your electricity bill. One kilowatt (kW) equals 1,000 watts, and one kilowatt-hour (kWh) is one hour of using electricity at a rate of 1,000 watts. New, energy-efficient refrigerators use about 1.4 kilowatt-hours per day, and about 500 kilowatt-hours per year. Megawatts are used to measure the output of a power plant or the amount of electricity required by an entire city. One megawatt (MW) = 1,000 kilowatts = 1,000,000 watts. The average size of US power plants is 213 MW. A 1000 MW power plant is a large plant. Gigawatts measure the capacity of large power plants or of many plants. One gigawatt (GW) = 1,000 megawatts = 1 billion watts. In 1990, if all US electrical generating plants were operating at full capacity at the same time, they would have produced 690 GW. "When magnets are moved near a wire, an electric current is generated in that wire." A battery produces electricity using two different metals in a chemical solution. A chemical reaction between the metals and the chemicals frees more electrons in one metal than in the other. One end of the battery is attached to one of the metals; the other end is attached to the other metal. The end that frees more electrons develops a positive charge and the other end develops a negative charge. If a wire is attached from one end of the battery to the other, electrons flow through the wire to balance the electrical charge. A load is a device that does work or performs a job. If a load –– such as a light bulb –– is placed along the wire, the electricity can do work as it flows through the wire. Electrons flow from the negative end of the battery through the wire to the light bulb. The electricity flows through the wire in the light bulb and back to the positive end of the battery. Electricity travels in closed loops, or circuits. It must have a complete path before the electrons can move. If a circuit is open, the electrons cannot flow. When we flip on a light switch, we close a circuit. The electricity flows from an electric wire, through the light bulb, and back out another wire. When we flip the switch off, we open the circuit. No electricity flows to the light. When we turn a light switch on, electricity flows through a tiny wire in the bulb. The wire gets very hot. It makes the gas in the bulb glow. When the bulb burns out, the tiny wire has broken. The path through the bulb is gone. Conventional electricity sources include coal, nuclear, oil, natural gas, and large hydropower facilities. These sources supply about 99% of the electricity used in the United States today. In a power plant, electricity is produced by generators, which are driven by turbines. Turbines may be powered by water, as in a hydroelectric plant, by wind, or by steam, as in a nuclear or fossil fuel plant. The generator is based on the principle of "electromagnetic induction" discovered in 1831 by Michael Faraday, a British scientist. Faraday discovered that if an electric conductor, like a copper wire, is moved through a magnetic field, electric current will flow (or "be induced") in the conductor. So the mechanical energy of the moving wire is converted into the electric energy of the current that flows in the wire. The boiler in a power plant has two basic functions: to burn fuel to produce heat and to use the heat to turn water into steam. Fuel enters the boiler's furnace and is ignited, producing heat. Inside the walls of the boiler are long, vertical tubes that contain water. As the temperature inside the boiler increases, the water begins to boil, forming tiny steam bubbles. The steam rises to the top of the boiler to a steam collection drum. From there, the steam travels through pipes to the turbine. The turbine transforms the thermal energy in the steam into mechanical energy. It provides the mechanical motion necessary for the generator to do its job. A turbine is constructed of a long shaft to which a series of blades are attached. This is called the rotor. As steam enters the turbine, it is directed through the sets of blades. The force of the steam against the blades causes the rotor to spin. It is similar to blowing on a pinwheel, but much faster. Steam turbines spin at 3,600 revolutions per minute (60 cycles per second or 60 Hz). The generator is directly connected to the turbine, so when the turbine spins, the generator also spins. 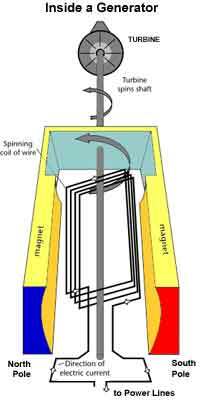 It transforms the mechanical energy (provided by the spinning turbine) into electrical energy. Electricity is produced by rotating a conductor through a magnetic field or by rotating a magnetic field around the conductor. Each time the conductor travels, or cuts, through the magnetic field, a voltage is created (induced). After leaving the generator, the electricity travels to the plant's substation where transformers are located. 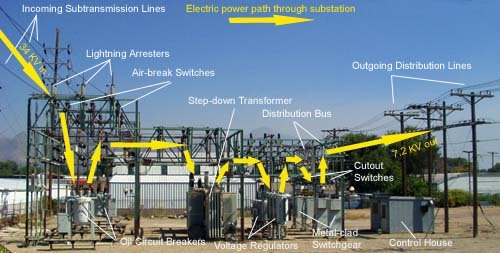 The transformer increases the voltage of the electricity so it can travel through the distribution lines efficiently. Then, in local areas, the electricity travels to another substation where transformers reduce the voltage again for consumer use. All this happens at the speed of light. 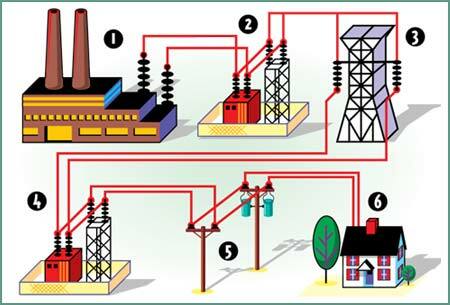 After electricity is produced at power plants it has to get to the customers that use the electricity. Our cities, towns, states and the entire world are criss-crossed with power lines that "carry" the electricity. electricity until it reaches a home or business (6). To solve the problem of sending electricity over long distances, William Stanley developed a device called a transformer. 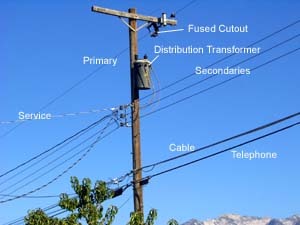 The transformer allowed electricity to be efficiently transmitted over long distances. This made it possible to supply electricity to homes and businesses located far from the electric generating plant. The electricity first goes to a transformer at the power plant that boosts the voltage up to 400,000 volts. When electricity travels long distances it is better to have it at higher voltages. Another way of saying this is that electricity can be transferred more efficiently at high voltages. The long thick cables of transmission lines are made of copper or aluminum because they have a low resistance. Some of the electrical energy is lost because it is changed into heat energy. High voltage transmission lines carry electricity long distances to a substation. The power lines go into substations near businesses, factories and homes. Here transformers change the very high voltage electricity back into lower voltage electricity. From these substations , electricity in different power levels is used to run factories, streetcars and mass transit, light street lights and stop lights, and is sent to your neighborhood. In your neighborhood, another small transformer mounted on pole or in a utility box converts the power to even lower levels to be used in your house. The voltage is eventually reduced to 220 volts for larger appliances, like stoves and clothes dryers, and 110 volts for lights, TVs and other smaller appliances. Rather than over-head lines, some new distribution lines are underground. The power lines are protected from the weather, which can cause line to break. After the generator produces the electrical charge, the current is sent through a transformer to make it the right voltage. This gives the electricity enough pressure to travel long distances. High-voltage transmission lines carry the electricity over hundreds of miles to your city or neighborhood. It reaches a substation, where the voltage is lowered to make it safe for residential use. The electricity travels through smaller distribution lines to your street. The power passes through a service drop and into the outdoor electric meter. From there, it reaches the service panel, where it branches off into separate circuits for each area of your home. All the distribution lines throughout the country are interconnected. This enables the utility companies to form "power pools" so that electricity can be distributed where it is needed, which means a power plant may, or may not, be supplying power to a local area. Electricity is a basic part of nature and it is one of our most widely used forms of energy. Long before any knowledge of electricity existed people were aware of shocks from electric fish. Ancient Egyptian texts dating from 2750 BC referred to these fish as the "Thunderer of the Nile", and described them as the "protectors" of all other fish. Electric fish were again reported millennia later by ancient Greek, Roman and Arabic naturalists and physicians. Possibly the earliest and nearest approach to the discovery of the identity of lightning, and electricity from any other source, is to be attributed to the Arabs, who before the 15th century had the Arabic word for lightning (raad) applied to the electric ray. Ancient cultures around the Mediterranean knew that certain objects, such as rods of amber, could be rubbed with cat's fur to attract light objects like feathers. Thales of Miletos made a series of observations on static electricity around 600 BC, from which he believed that friction rendered amber magnetic, in contrast to minerals such as magnetite, which needed no rubbing. Thales was incorrect in believing the attraction was due to a magnetic effect, but later science would prove a link between magnetism and electricity. Many cities and towns were built alongside waterfalls (a primary source of mechanical energy) that turned water wheels to perform work. Before electricity generation began slightly over 100 years ago, houses were lit with kerosene lamps, food was cooled in iceboxes, and rooms were warmed by wood-burning or coal-burning stoves. Beginning with Benjamin Franklin's experiment with a kite one stormy night in Philadelphia, the principles of electricity gradually became understood. In the late-1800s, Nikola Tesla pioneered the generation, transmission, and use of alternating current (AC) electricity, which can be transmitted over much greater distances than direct current. 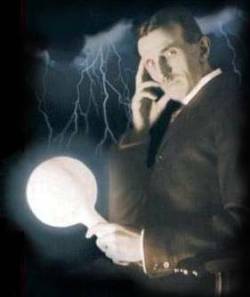 Tesla's inventions used electricity to bring indoor lighting to our homes and to power industrial machines. 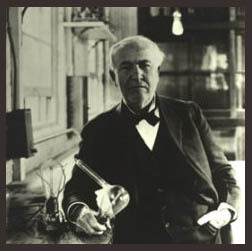 Thomas Edison helped change everyone's life -- he perfected his invention -- the electric light bulb. Thales, a Greek, found that when amber was rubbed with silk, it became electrically charged and attracted objects. He had originally discovered static electricity. William Gilbert (England) first coined the term electricity from elektron, the Greek word for amber. Gilbert wrote about the electrification of many substances. He was also the first person to use the terms electric force, magnetic pole, and electric attraction. Otto von Guericke (Germany) described and demonstrated a vacuum, and then invented a machine that produced static electricity. Robert Boyle (Ireland) discovered that electric force could be transmitted through a vacuum and observed attraction and repulsion. Stephen Gray (England) distinguished between conductors and nonconductors of electrical charges. Georg Von Kleist (Germany) developed the first electric capacitator, a device for storing electricity. Pieter van Musschenbroek (the Netherlands) independently developed an electric capacitator that would be called the Leyden jar after the University of Leyden where he worked. Ben Franklin (United States) tied a key to a kite string during a thunderstorm, and proved that static electricity and lightning were the same thing. Alessandro Volta (Italy) invented the first electric battery. The term volt is named in his honor. Sir Humphry Davy (England) invented the first effective lamp. The arc lamp was a piece of carbon that glowed when connected by wires to a battery. Separate experiments by Hans Christian Oersted (Denmark), Andre-Marie Ampere (France), and Francois Arago (France) confirmed the relationship between electricity and magnetism. Michael Faraday (England) discovered the principle of electro-magnetic rotation that would later be the key to developing the electric motor. George Ohm (Germany) defined the relationship between power, voltage, current and resistance in Ohms Law. Using his invention the induction ring, Michael Faraday 9England) proved that electricity can be induced (made) by changes in an electromagnetic field. 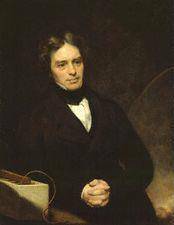 Faraday's experiments about how electric current works led to the understanding of electrical transformers and motors. Joseph Henry (United States) separately discovered the principle of electromagnetic induction but did not publish his work. He also described an electric motor. Using Faraday's principles, Hippolyte Pixii (France) built the first dynamo, an electric generator capable of delivering power for industry. Pixii's dynamo used a crank to rotate a magnet around a piece of iron wrapped with wire. Joseph Henry (United States) invented the electrical relay, which could send electrical currents long distances. Thomas Davenport (United States) invented the electric motor, an invention that is used in most electrical appliances today. Sir William Robert Grove (Scotland) developed the first fuel cell, a device that produces electrical energy by combining hydrogen and oxygen. James Prescott Joule (England) showed that energy is conserved in electrical circuits involving current flow, thermal heating, and chemical transformations. A unit of thermal energy, the Joule, was named after him. Samuel Morse (United States) invented the electric telegraph, a machine that could send messages long distances across wires. The mathematical theory of electromagnetic fields was published.J.C. Maxwell (Scotland) created a new era of physics when he unified magnetism, electricity, and light. Maxwell's four laws of electrodynamics (Maxwell's Equations) eventually led to electric power, radios, and television. Charles Brush (United States) invented the open coil dynamo (or generator) that could produce a steady current of electricity. Joseph Swan (England) invented the first incandescent lightbulb (also called an electric lamp). His lightbulb burned out quickly. Thomas Edison (United States) founded the Edison Electric Light Co. in New York City. He bought a number of patents related to electric lighting and began experiments to develop a practical, long-lasting light bulb. After many experiments, Thomas Edison (United States) invented an incandescent light bulb that could be used for about 40 hours without burning out. By 1880, his bulbs could be used for 1,200 hours. Electric lights (Brush arc lamps) were first used for public street lighting in Cleveland, Ohio. California Electric Light Company, Inc. in San Fransicso was the first electric company to sell electricity to customers. The company used two small Brush generators to power 21 Brush arc light lamps. The electric streetcar was invented by E.W. v. Siemens. Thomas Edison(United States) opened the Pearl Street power station in New York City. The power station was one of the world's first central electric power plants and could power 5,000 lights. It used a direct current (DC) power system, unlike the power systems that we use today which use alternating current (AC). The first hydroelectric station opened in Wisconsin. Edward Johnson first put electric lights on a Christmas tree. Nikola Tesla (U.S. immigrant from Austrian Empire) invented the Tesla coil, a transformer that changed electricity from low voltage to high voltage, making it easier to transport over long distances. Nikola Tesla invented the electric alternator for producing alternating current (AC). Until this time, electricity had been generated using direct current (DC) from batteries. Sir Charles Algernon Parsons (England) invented a steam turbine generator, capable of generating huge amounts of electricity. William Stanley, Jr. (United States) developed the induction coil transformer and an alternating current electric system. Nikola Tesla (U.S. immigrant from Austrian Empire) demonstrated the first polyphase alternating current (AC) electrical system. His AC system included all units needed for electricity production and use: generator, transformers, transmission system, motor (used in appliances) and lights. George Westinghouse, the head of Westinghouse Electric Company, bought the patent rights to the AC system. Charles Brush (United States) was the first to use a large windmill to generate electricity. He used the windmill to charge batteries in the cellar of his home in Cleveland, Ohio. The Westinghouse Electric Company used an alternating current (AC) system to light the Chicago World's Fair. 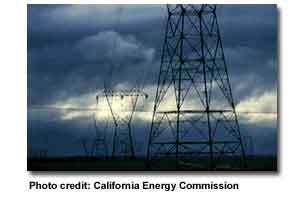 A 22-mile AC powerline was opened, sending electricity from Folsom Powerhouse in California to Sacramento. The Niagara Falls hydropower station opened. It originally provided electricity to the local area. One year later, when a new alternating current (AC) powerline was opened, electric power from Niagara Falls was sent to customers over 20 miles away in Buffalo, New York. Joseph John Thomson (England) discovered the electron. The first power line between the United States and Canada was opened at Niagara Falls. The world's first all turbine station opened in Chicago. The world's largest generator (5,000 watts) was opened at Shawinigan Water & Power; and the world's largest and highest voltage line (136 kilometers and 50 kilovolts) brought power to Montreal. J. Spangler (United States) invented the first electric vacuum cleaner. The world's first pumped storage plant opened in Switzerland. W. Carrier (United States) invented electric air conditioning. Thomas Edward Murray (United States) created the first air pollution control device, the cinder catcher. A. Goss invented the electric refrigerator. The transistor was invented by scientists at Bell Telephone Laboratories. Almost all American farms had electricity. John Hopps (Canada) discovered that if a heart stopped beating owing to to cooling, it could be started again by artificial stimulation using mechanical or electric means. This lead to his invention of the world's first cardiac pacemaker. The world' s first nuclear power plant (Russia) started generating electricity. The Atomic Energy Act of 1954 was passed. It allowed private ownership of nuclear reactors. Chaplin, Fuller, and Pearson (United States) working for Bell Labs, invented the first solar cell. The Shippingport reactor in Pennsylvania was the first nuclear power plant to provide electricity to customers in the United States. The first commercially available integrated circuits were produced by the Fairchild Semiconductor Corporation (United States). All computer manufacturers started using chips instead of the individual transistors and their accompanying parts. The first electronic desktop calculators were the ANITA Mk VII and Mk 8, which used vacuum tube technology.